The Grand Rapids Griffins begin their defense of the American Hockey League’s (AHL) Calder Cup this week, where they’ll have to battle significant roster turnover from last year’s championship team. The loss of key players was evident early on as the Griffins got off to a dejected 4-5-1 start that turned into a 9-13-3 mark in early December. Evgeny Svechnikov began to find his game as things came together, but NHL call-ups continued to cause problems. After a 6-0-0-1 stretch, the Griffins got Svechnikov and defenseman Joe Hicketts back into the lineup, where they helped the team finish 3-1-1-0 over the final five games and earn their sixth straight postseason berth. The Griffins finished second in the Central Division to match up with the Manitoba Moose in the first round. The best-of-five series starts with a pair of games Saturday and Sunday in Manitoba, the full schedule can be found here. The divisional rivals trended in opposite directions over the final ten games of the regular season. Manitoba went 3-7-0-0 while Grand Rapids went 7-1-1-1. The momentum will be huge for the Griffins, who bested the Moose in six of eight meetings this season but have depth questions heading into the postseason. During last year’s Calder Cup playoffs, Tomas Nosek led the team with 10 goals and 22 points in 19 games. 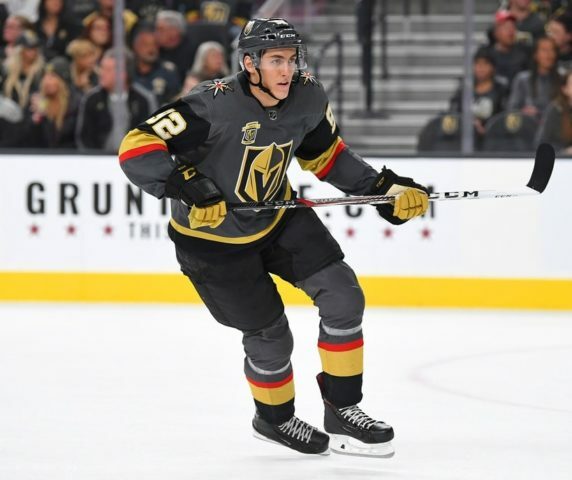 The NHL’s Vegas Golden Knights selected him during last June’s expansion draft. Including Nosek, the Griffins lost four of their top six scorers from last year’s championship team. That includes 2017 Playoff MVP Tyler Bertuzzi, who earned a full-time role with the Red Wings this season. The waiver-exempt Bertuzzi was eligible to return to Grand Rapids for the playoffs, but Detroit decided to give him a longer offseason to train for 2018-19. Martin Frk is another loss for the Griffins this go-around. He scored five goals and 15 points in 16 postseason games, good enough for sixth in team playoff scoring. He also earned a spot in Detroit this season. Finishing one point ahead of Frk was Mitch Callahan, who had spent the previous six seasons in Grand Rapids, where his physically intimidating presence helped shut down opponents. He signed with the Edmonton Oilers over the summer, where he’s played with their AHL affiliate, the Bakersfield Condors. Kyle Criscuolo also found a new AHL team, where he and Nathan Paetsch—who captained the Griffins last season—joined the Rochester Americans. They finished tenth and 12th, respectively, in team playoff scoring, combining for seven goals and 16 points. Announced last week, the Griffins will also be without Dominic Turgeon, who was diagnosed with a blood clot and remains out indefinitely. He put together an impressive sophomore campaign with 32 points (14 goals and 18 assists) in 69 games as a reliable two-way center. But of course, for every loss, the Griffins added a new name. An early-season trade between the Detroit Red Wings and New York Rangers brought in Matt Puempel in exchange for defenseman Ryan Sproul. Puempel finished third on the team with 22 goals and 54 points in 57 games. Defenseman Filip Hronek put together a fantastic rookie season, where his 39 points (11 goals and 28 assists) placed him fourth in team scoring and earned him AHL All-Rookie Team honors. He led the Griffins with a plus-24 rating. Turgeon’s plus-13 was the next-highest mark. Hronek skated in two playoff games last year, finishing with a minus-2. Detroit #RedWings #TopProspect Filip Hronek (20 years old) had himself a night in Grand Rapids. The defenseman had 1 goal + 3 assists after being named to the #AHLAllRookieTeam. 4 point night for DET prospect Hronek. #Hronek now top 10 among Dmen in AHL scoring. Axel Holmstrom, who will likely slot into Turgeon’s second-line center role, will be a key piece for a long playoff run. Holmstrom, 21, joined the team last year after 16 games with Skellefteå AIK of the Swedish Hockey league (SHL). He recorded just one goal and assist in that time, but added three goals and four assists in seven playoff games. Holmstrom then got into seven games with the Griffins, scoring a goal and an assist. He added another goal in four playoff games. This year, he scored seven goals and 26 points in 66 games, finishing with a team-worst minus-11. Other additions include Turner Elson, Corey Elkins and Dominik Shine. The trio combined for 26 goals and scored 21, 20 and 16 points, respectively, as bottom-six forwards. 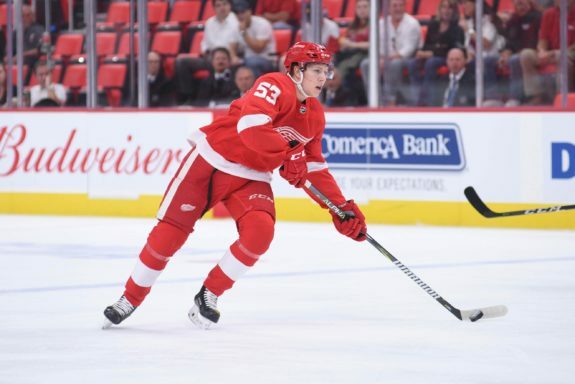 All eyes will be on Svechnikov, who impressed in his 14-game stint with the Red Wings this season, even if it only amounted to four points (2 G, 2 A). A strong postseason will help him make a case for a roster spot next season. As the 19th overall pick in the loaded 2015 draft, Svechnikov seems destined for NHL success and his chance to carry the team this spring would help it come quicker. Christoffer Ehn, a 2014 fourth-round pick by Detroit, is joining the Griffins now that his SHL season with Frölunda HC has come to an end. A fast, defensive center, he could be put right onto the fourth-line with a lack of reliable depth down the middle given Turgeon’s condition. Ehn, 22, scored seven goals and 17 points in 50 games this season in Sweden’s top league. Following an impressive rookie season in the Western Hockey League (WHL), Dennis Cholowski was a hot commodity at the trade deadline. Drafted 20th overall in 2016, the defenseman was an off the radar pick by Detroit, but he’s proving to have something in him. Cholowski scored 14 goals and 66 points in 69 games with a plus-29 rating before adding another five goals and seven points in 12 playoff games. He will join Grand Rapids for the playoffs, where he should earn some more playing time. Center Michael Rasmussen, winger Givani Smith and defenseman Jordan Sambrook all remain in the playoffs with their respective junior teams, but could each find themselves in Grand Rapids pending the length of its postseason. There’s talent for coach Todd Nelson to pick from, but the playoffs are hardly the time to experiment, so he could favor those he already trusts while young players remain as Black Aces.